Intelligence cycles are impaired by poor decision support systems. This article about decision support systems was published in the Intelligence, Surveillance & Reconnaissance Journal (May 2004). Not much has changed since then, so I thought repeating what I said back then would be as good a place as any to start this blog. 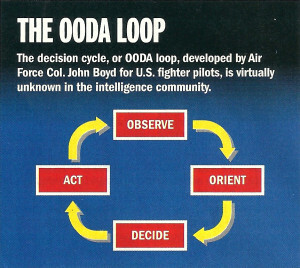 Central to understanding the reasons for past intelligence failures and spiraling intelligence system costs is knowledge of the decision cycle or OODA loop (Observe Orient Decide Act) teachings of Colonel John Boyd, considered by some to be one of the foremost military thinkers of all time. The failure to fully and systematically embrace Boyd’s teaching is the root of many of the problems faced by US intelligence organizations in their attempts to adapt to today’s rapidly changing and complex information environment. The world has changed. Today’s intelligence threats are no longer few, large, and slow; they are small, diverse, many and fecund, and are evolving at a ferocious rate. Our failure to adapt in responding is both a technical and an infrastructural problem. It comes from a failure on the part of existing technologies and intelligence organizations to consider the impact of decision cycles in any of their doings. Organizational failings are largely the result of ignorance and complacence. Technical failings are simply due to the fact that the systems to enable this approach have never existed in order to be adopted. Modern competitive business intelligence cycles are now based on derivatives of the Boyd Cycle. Boyd’s insights came as a result of his studies (and experience) of air-to-air combat in the Korean War. He discovered that there were two main factors enabling U.S. pilots to consistently win dogfights. First, the F-86 fighter’s canopy was larger than that of the opposing Mig-15, providing a greater field of vision. Second, although the F-86 was larger and slower, it was more maneuverable (higher roll-rate), allowing US pilots to make more frequent adjustments. Thus US pilots were better able to observe and orient. The result of formalizing Boyd’s insight became a fundamental part of air-force fighter tactics, and was later embraced by the Marine Corps. In the intelligence community, his work is virtually unknown. Contrast this to the traditional intelligence cycle which begins when the intelligence consumer makes a request for information. That is followed by the intelligence process of requirements tasking, data collection and analysis. Finally the requested information is produced and disseminated. The cycle is too slow. Indeed, it is not clear that it is a cycle at all, since most requests result in a single iteration. The existence of various organizations in the cycle and the time taken for information to pass through bureaucratic interfaces, prevent the cycle from keeping up with events. It is essentially command-driven, and thus only allows looking into questions that the intelligence consumer already ‘knows’ to ask. But an effective cycle must support the discovery of things you didn’t even know were important. 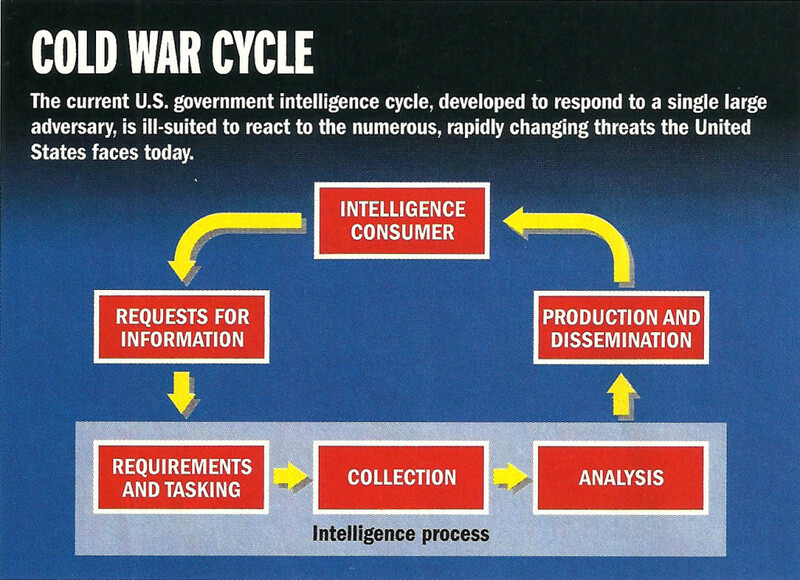 The consumer cannot anticipate all possible threats and task the complete cycle to investigate each. The lack of feedback between the consumer and the analyst, and the inability of the consumer to directly examine backup material behind analytical conclusions, can cause the final product not to meet the consumer’s needs. 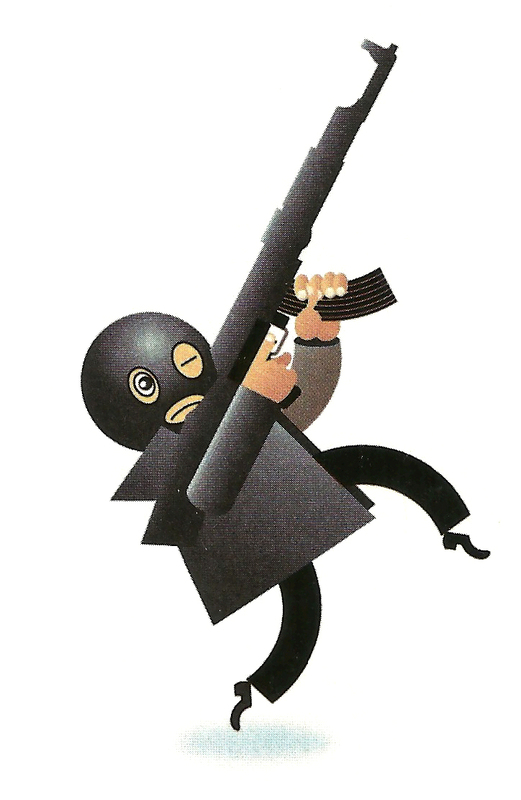 The community’s failure to move to a modern cycle is primarily due to a failure to adapt to the post-Cold-war world in which the enemy is no longer the U.S.S.R. but a diverse, loosely coupled, and rapidly adapting amalgam of terrorist organizations and other assorted bad guys. Only a fraction of the problem now relates to threats posed by sovereign states. In the good old days of the Cold War, U.S. capabilities to gather and act on intelligence were somewhat better than Soviet Union’s. In a competitive sense, the U.S. was ‘bigger’. More importantly, the Soviets were hampered by a hopelessly slow and ineffective decision cycle caused by bureaucracy and a pervasive culture of distrust throughout the organizational pyramid. With both capability and adaptability in its favor, the U.S. community, oblivious of OODA loops, gradually settled into a culture of confidence and complacency. From these roots came the “big-iron” mentality (same again but super-size me!) that pervades the intelligence community. 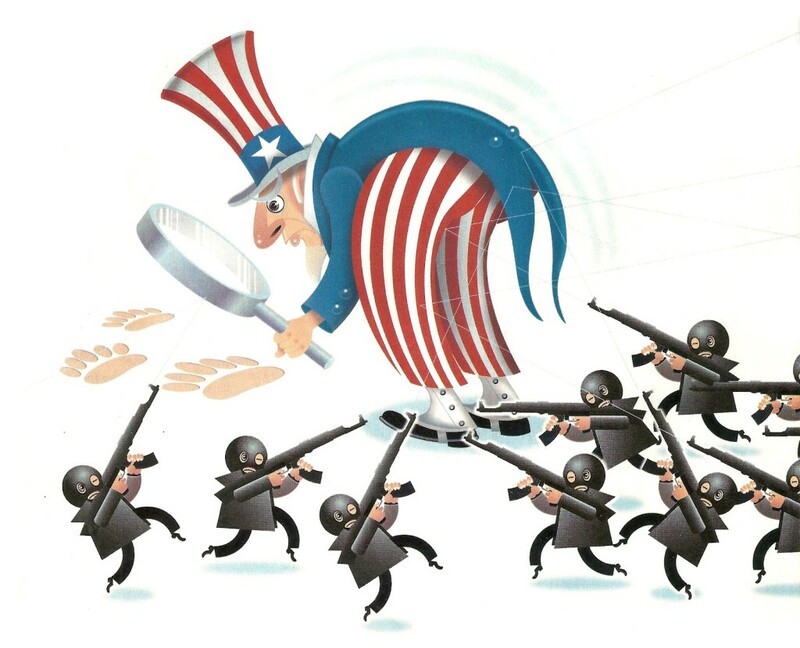 Instead of a dominant intelligence community being confronted by a single, somewhat smaller force, the United States today is like some large animal being attacked by a swarm of bees. It cannot track and swat every bee in the swarm because its attention must focus on each in turn, and it takes time to actually swat and kill one. Each sting hurts only a little, and we can certainly swat whatever stings us, but there are plenty more bees out there, and the end result is always the same. The animal will finally collapse, surrounded by a mountain of dead and dying bees. All that is needed for this strategy to work is a vast supply of worker bees, largely working independently, and willing to die for the cause. The swarm-of-bees attack is effective, not because it brings overwhelming force to bear (the total weight of the bees is a tiny fraction of their victim), but simply because it overloads the OODA loop of the victim. Yet this centralized command-driven structure is exactly that of our intelligence organizations. Intelligence consumers cannot be aware of all potential foes, let alone issue orders to track and destroy them through a command/decision cycle that is measured in weeks or perhaps months. We can imagine our ideal intelligence organization consisting of a large triangle composed of many smaller triangles, each able to swivel independently to orient itself and empowered to separately track potential foes. 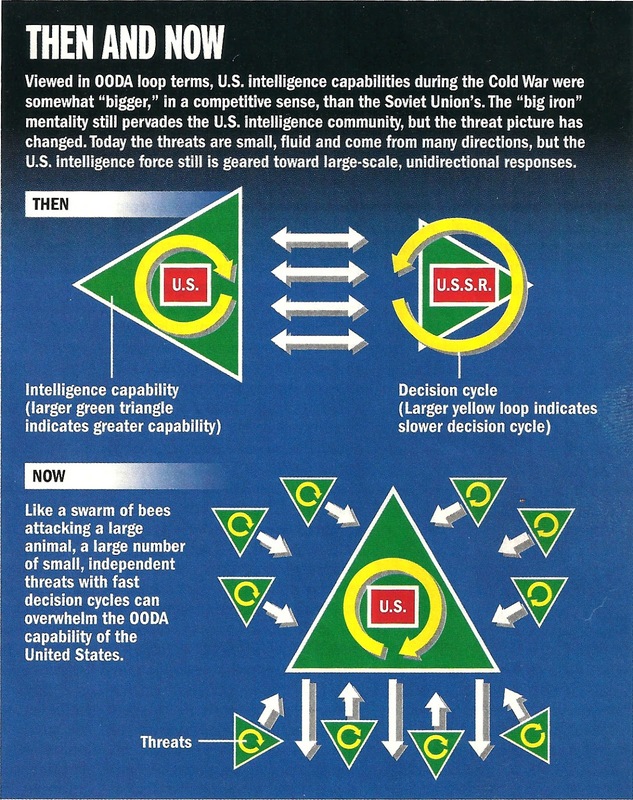 Each triangle can rapidly pass its findings through the hierarchy to decision-makers and simultaneously to the “swatter” – the U.S. military. If we could only track, target, and decide to swat our foes, we certainly have the power to do the swatting. Why don’t we see such a structure? 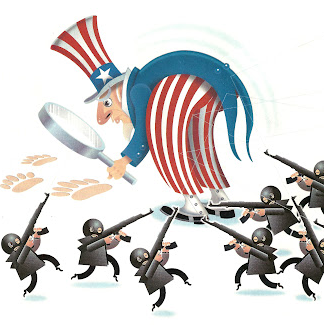 It is unfair to place all the blame on the intelligence agencies, though they are culpable. They can only create such an organization if we give them the technical tools needed to do so. Here the blame for failure lies squarely on the technologists and the companies the government relies on for advice and implementation. 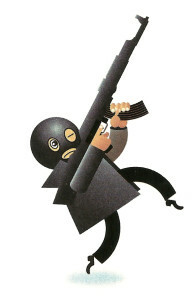 It is these entities -the big prime contractors and the “Beltway Bandits” – that share the guilt for our sluggishness. The intelligence cycle itself must become a Boyd cycle, practiced at all levels of the intelligence hierarchy. Boyd’s key lesson is that the ability to rapidly adapt to change is the most important determinant in any competitive situation. Cycle rate determines success, and so deployed systems must be able to adapt faster than the user organizations, the information environment and as fast as our foes. This point is either not known or is ignored by the major government systems vendors. These vendors, oblivious of OODA loops, still propound the big-iron approach they are so good at and which has been so kind to them. The government is ill equipped to specify software systems and so must either engage these companies to do the job or hire its own technical staff to do so. Given the discrepancy between government and industrial salaries, the government cannot hire the huge numbers of technical people required. To solve this it uses Systems Engineering and Technology Assistance (SETA) contractors who are, in fact, employed by the usual vendors but are ‘leased’ to the government to use as if they worked directly for it, and thus had the independence necessary to truly examine the technical issues involved. It is these SETA contractors who eventually drive the direction of government technical developments. It is therefore no surprise that the overwhelming bulk of such contracts are awarded to the same few players that participate in the SETA pool and which use the same outmoded (and profitable) big-iron approaches. Moreover, these vendors have deliberate policies of hiring senior ex-government people, not only for their invaluable experience but, just as importantly, for their contacts. This chain of contacts effectively sweeps up the bulk of government contracts, ensuring that the usual pool of players remains relatively pure. The intelligence community, with its intense security ethos and somewhat insular mindset, naturally falls prey to these problems at a higher rate than any other branch of government. Furthermore, government imposes so many hurdles on the participation of small, nimble information companies, ranging from its security requirements, to its outmoded development models, that it is almost impossible for the community to take advantage of these companies, which either starve, or are swallowed up by the larger vendors to acquire technology. Regrettably the larger entity just gets fatter; it seldom acquires any of the nimbleness of its prey. All these factors mean the government is isolated from the best advances in the information realm and must make do with a sort of distillate of such advances secreted by the usual large vendors. It is not surprising then, that information systems provided to, or specified by, the government are generally obsolete at the time they are delivered, or shortly thereafter. To understand our technology failures, we must look at the OODA loop in terms of its implications on supporting information and decision support systems, which can be classified as a pyramid with data at the base, information on the next level, then knowledge and, finally wisdom at the summit. Data-level systems contain large amounts of data points concerning the target domain but have not yet organized this data into a human-useable form. Such systems are primarily found during the ingestion phase. Information-level systems have taken the raw data and placed it into tables that can be searched and displayed by the system users. The overwhelming majority of today’s systems operate in this realm. Knowledge-level systems have organized the information into richly interrelated forms tied directly to a mental model or ontology that expresses the kinds of things being discussed and the interactions that are occurring between them. Few systems today operate at this level, but those that do allow their users to find ‘meaning’ in the information they contain. Wisdom-level systems allow users to view new knowledge against past knowledge, to see patterns, and to predict the intent of entities of interest those patterns might imply. Unfortunately, there are no Wisdom-level systems in existence for any generalized domain. Wisdom remains the exclusive purview of system users. Let us examine the intelligence OODA loop in terms of the types of systems it requires to operate. Observe. Acquiring knowledge from as many sources as possible as fast as we can is a Data-level undertaking. We can now gather observations on a global scale, and with a fidelity and diversity that is almost beyond comprehension. No problem here. Act. To act we must provide easily understood Information to those that must act. 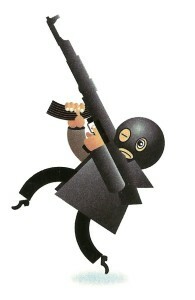 The tools available to the U.S. to act, should it choose to, are without equal. No problem here either. Orient. To orient, we must place observations in the context of all others, in preparation for a decision. Here we have a problem. Orientation not only requires converting every source into a unified whole to be searched consistently by users (an Information level problem), but also, given the massive diversity in source formats, we must convert into a common “ontological” form so that the users can efficiently compare meaning. This requires a Knowledge-level system, but few such systems exist, and none operate on a general domain such as intelligence. Technology has failed us. The state of affairs at this time is that our agencies have thousands of mostly archaic, isolated, Information-level systems (or stovepipes), each focusing on a single source or problem area. Worse yet, system output is not available to everyone that needs it, and for those that do have it, the interface to each is different, overloading our analysts as they try to integrate in their head all that they have seen to find meaning. Thus analysts spend the majority of their time in the mechanics of accessing the data, and only a tiny fraction in actual analysis (or Orientation). The solution we adopt is to add people, thousands upon thousands of them, to try to close this portion of the loop. Decide. Decisions require Wisdom. We must evaluate our new knowledge against past experience and patterns, determine what these new patterns mean, and then model the potential consequences of our actions on the outside world and the OODA loops of our enemies. None of these steps is even partially supported by today’s systems, certainly not in a manner that is tightly linked to the entire OODA loop and allows free intermixing of modeling information with real-world data. Yet this is the nature of Wisdom. Finding no solution to this problem either technically or organizationally, people have simply learned to live with it. 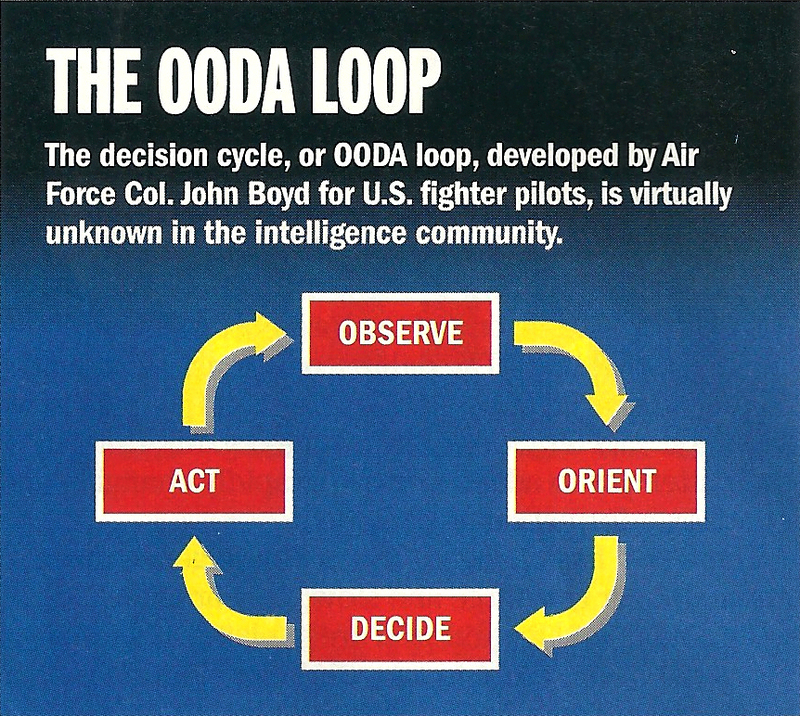 In addition to problems with each step in the loop, a meta-problem exists: Even if we could grease the inner wheels of each step more effectively, we have no axle to turn our overall OODA wheel. For information to flow around the cycle rapidly, recursively, and effectively, all participant systems must pervasively communicate with all others. We need one community-wide ontology-based system, operating at all four levels, and allowing all portions of the loop to interact with information, validate each other’s conclusions and introduce new knowledge into the cycle. No such framework is in serious development within the community today. Our OODA wheel may as well be bogged down in quicksand, while billions of taxpayer dollars are squandered in feeble efforts, reported as though the necessary progress is being made, to address the threats we see in a post 9/11 World. Not one of these efforts has philosophically faced up to the erosive power of change on itself, let alone on its users. To facilitate the organizational OODA loop, technology itself must iterate through an adaptive cycle as fast or faster than the changes the user organization experiences. Failure to do so can stop the organizational OODA loop as it waits for its information systems to catch up. But software changes currently take months or years. The crux of the problem lies in current development strategies, which fail dramatically due to the “Software Bermuda Triangle” effect. Conventionally, during software development, programming teams are split into three basic groups, Graphical User Interface, Database, and Applications. Each group tends to pull the design in its own ‘focus’ direction and to have no more than a passing understanding of the issues and needs of the other groups. While such a ‘molecule’ is stable (with strong management) during development, the differential impact of change on each ‘atom’ during maintenance inevitably leads to erosion and eventual obsolescence. All it takes is a steady supply of severe changes for the system to break apart and tie itself into knots. We must first eliminate this effect before we address intelligence OODA loops. Unfortunately, object-oriented programming techniques only make things worse on the very large scale. As for every problem there is no shortage of groups claiming to have a solution. Since September 11, 2001, it must be a noisy world in intelligence systems acquisition. Everyone has proposals to help. The usual players are there too, largely unfamiliar with the field, but eager to ensure that their government food source is not nibbled at by others. The bees are back, this time unwittingly overwhelming the OODA loop of the very group they are trying to help. The result is that government information technology policy at the moment behaves much like a family of rabbits caught in the road by oncoming headlights. Each family member moves a few small steps in one direction, looses its nerve, and then starts off in another direction, bumping into each other as they go. Meanwhile the headlights grow ever larger and closer. In the future, vendors must perform an OODA loop analysis, not only of the target customer usage and information environment, but more importantly, of the system itself. We cannot ignore change in our designs. It is inevitable. Systems must be based on a generalized architecture that systematically addresses OODA loop issues. On top of this, we can integrate the many valuable technologies that others can provide to address specific portions of the problem. Such architectures exist today, and such a system would be an information strategic weapon. But we must first admit our problem. It is not complexity. It is not scale. It is change. Given this, we can seek out and recognize the cure. 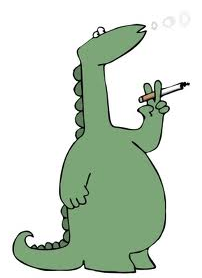 The dinosaurs ruled the earth for 120 million years. They are all gone. They failed to adapt to change. In the information world, timeframes are infinitely shorter and change immeasurably faster. Our intelligence infrastructure has ruled unchallenged since the 1940s, but the world is changing. Let’s not make the same mistake as the dinosaurs.